The top digital companies in the Asia Pacific region represent both a threat and an opportunity to global enterprises, and CIOs ignore them at their own risk, reports Gartner. The analyst firm says CIOs involved in building or expanding a digital business need to identify and understand Asia's top disruptors as early as possible and work with their strategic planning groups to decide to collaborate with or compete against these digital giants. Gartner predicts that through 2021, 80 per cent of traditional companies will lose 10 per cent in market share due to disruptive competition and/or the inability to disrupt themselves. CIOs and IT leaders in global enterprises are familiar with US-based digital giants Google, Facebook, Amazon and Apple, but those in Asia are normally shrouded in regard to how they are disrupting the digital business landscape, according to CK Lu, research director at Gartner. "Prioritising global IT investments will be incomplete without a thorough study of Asia Pacific digital disruptors within clear categories of opportunities," says Lu, at the Gartner Symposium/ITxpo at the Gold Coast. "GDP growth in Asia Pacific is 1.6 times faster than the worldwide market. Adoption of technologies like mobile wallets is much higher, and you can reach 1.7 billion internet users in these markets. “As Chinese and American digital giants battle to disrupt global markets, no one can afford to sit on the sidelines." To determine the top digital disruptors in Asia Pacific, Gartner's model considered three factors (scale, reach and richness) in measuring companies' impact across four major elements of disruption — technology, business, industry and society. The investment prioritisation that emerges from these perspectives can provide a clear set of directions for future innovation. 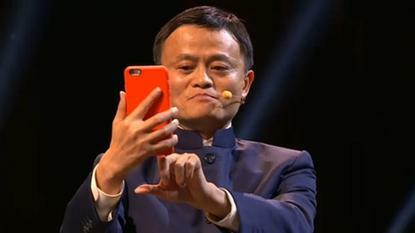 Lu cites three options for responding to the rise of Asia's digital giants. Leverage: Businesses with operations in Asia Pacific can be at a disadvantage using US or European suppliers and partners, and should redesign IT infrastructures by leveraging Asian digital businesses if their revenue, customers or clients are weighted toward Asia. For example, CIOs should consider switching to China-based cloud services that can operate in China instead of using global services that may face limitations, either from regulation or localisation. 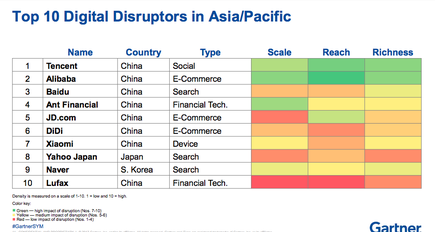 Compete: So far, most Asia Pacific digital disruptors have sought to take over consumer areas, such as homes and transportation. However, digital giants are now moving beyond B2C to B2B, government and enterprise areas, such as the industrial and medical industries. This gives enterprises a window of opportunity to build a digital platform or lead a digital ecosystem. If the enterprise has a very strong brand and relationships with customers and partners, it can re-evaluate old enemies and build an ecosystem to jointly compete against the digital disruptors. Cooperate: Global enterprises have some advantages they can use to build a cooperative relationship with digital giants in Asia, such as their own valuable internal data, global expertise and business presence outside the Asia Pacific region. Enterprises should build a special task force to transform their businesses into digital to cooperate with digital giants in Asia. CIOs must recognise the cultural and working model differences because these companies are often more agile — and operate at a much smaller business scale. Re-evaluate old enemies and build an ecosystem to jointly compete against the digital disruptors. "Each digital disruptor claims a unique stake in the digital business ecosystem of Asia, and is only growing from strength to strength," says Lu. "CIOs and IT leaders need to ask if they are suitable candidates to collaborate with or compete against — ignoring them is not an option."